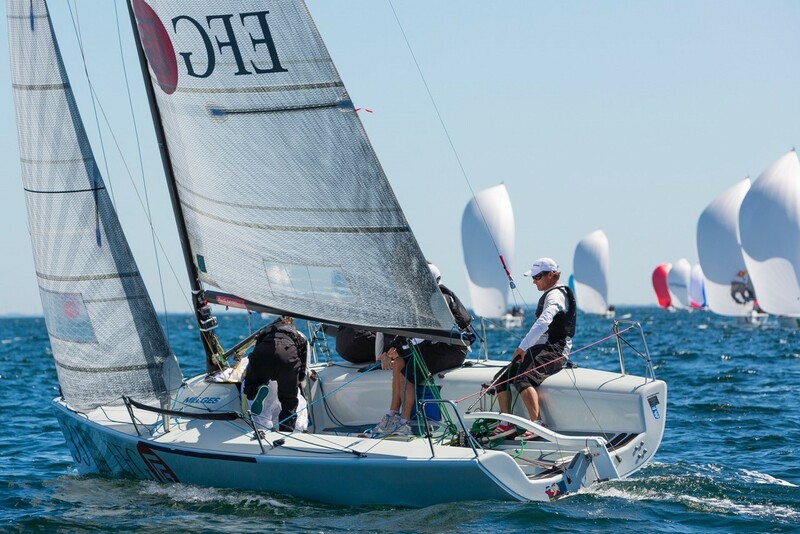 Chris Rast and the EFG Sailing team won the 2015 Melges 24 World Championship in spectacular fashion last weekend. In the 95-boat fleet, they won five of 12 races, winning the title by a 53-point margin. This past week, Quantum’s Global One Design Director Allan Terhune talked with Chris about his experience. Photo by Mick Knive Anderson. Allan: The Melges 24 is the ultimate team boat. Tell us a little about your team and what sets them apart. Chris: We had mostly local sailors from our club on Lake Thun onboard, and our trimmer Udo is from Austria. Udo previously sailed on our Melges 24 team in 2013, and I know him from my early 49er days. We race hard on the water, but also know how to relax once we get back to shore. A: We heard (and the results showed) that you were very fast. What did you do differently that you think gave you an edge? C: Speed is always relative, at least in our world! We knew we had very solid speed and were confident in our settings and the way we sail the boat through the whole wind range. Our Quantum Sails are very polyvalent and easy to sail to, which is super important when you have to get off the line quick in a confused sea state. That said we were also quick in the flat water, just adapting our trimming accordingly. The other focus point was very active jib trimming, especially in the 7-10 knot range when the boat goes from under-powered to over-powered. The Quantum jib has excellent leech response and rewards proper jib trim accordingly. A: What was your training plan/practice leading up to the regatta? C: Not as good as we wished for. We sailed two regattas early in the season, winning the second one! That was important to establish confidence in our tuning and speed potential. We had two more practice days at the Worlds’ venue, where we mainly focused on boat handling as we had a new guy doing bow. That said, I had sailed in Middelfart two years ago and won the Danish Melges 24 Championships, so I felt pretty comfortable sailing at Worlds. A: What is your impression of the class? C: It’s amazing to get 95 boats at a major championship. The really cool thing was the huge turnout of Corinthian teams. This is a clear testament to how strong this 21-year old class still is. A: Why did you choose Quantum Sails for your program? C: I have worked with Quantum for many years now and was involved in designing the sails that Carlo Fracassoli won the Worlds with in 2012 in Torbole. I love how the sails go through the range and hold shape, even as they get a couple of regattas on them. A: What adventures are in the future for Chris Rast? C: I keep myself plenty challenged sailing Melges 32s (tactician for the HedgeHog), sailing my moth, and managing/sailing on a Decision 35 (catamaran) on Lake Geneva in Switzerland. It keeps me on my toes! On top of that, we have a baby on the way and that will be an even bigger adventure. A: What words of advice would you give a team that wants to try to win a major championship? C: Put a fun and committed team together, because that’s the most important part to winning any regatta. Make sure you give everyone enough time to sort out their jobs on the boat, and then let them do their jobs! Don’t overthink the regatta. In the end, you need to get off the starting line in good fashion and get on the first shift. Keep it simple. When things go sideways, crack a joke, re-focus, and get back at it. A: Any funny stories form the event? C: Plenty! But more important is the camaraderie between all the teams that makes this class so special. On the third day, our engine stopped working on our way out to the race course. It was really light and we were basically going backwards because of the strong current. Then Andrea Rachelli (Altea), who was laying in second place behind us, came along and gave us a tow all the way out the race course. How cool is that! Congratulations to Chris and the crew of EFG Sailing on a great event. For full results, click here.